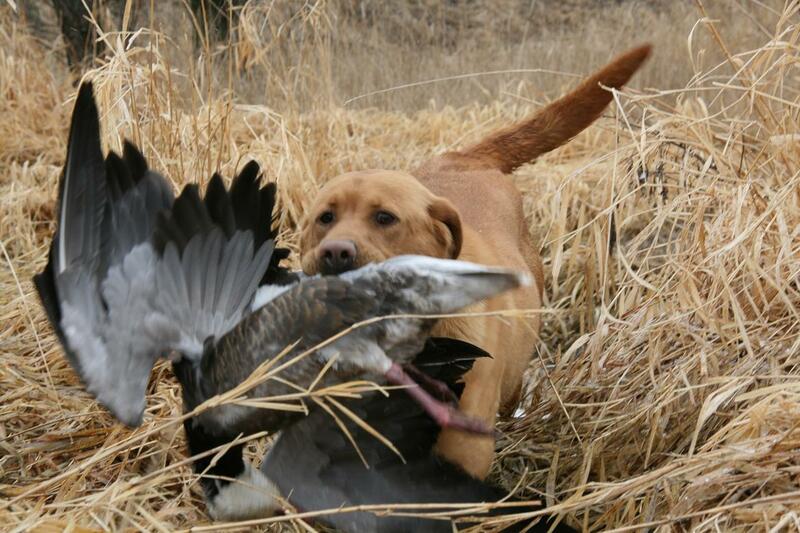 Turkey Creek's Dunn Fowled Out--"Goose"
"Goose is a stunning, gorgeous red 70 pound blocky male with classic lab conformation! His sire is 1 1/2 time GMPR Elcanan Jumpin' Jake SH (FC Pin Oaks Texas Rex X FC AFC Crow Rivers Malarky's Cougar daughter). His dam is GMPR Bearpoint's Sage Well Dunn (2 time GMPR HRCH Black Forest Bear Grits MH X CP Lady Catherine Wagging Light - Daughter of GMPR Riks Risky Raider MH X GMPR Elcanan's Angel of HNTR'S PT MH). We finally have the "YELLOW" male we've been waiting for. Many came and went through our kennel but GOOSE stayed!! He has matured from a pup that refused to be left at home when we loaded up the dogs to go pheasant hunting to a bird crazy outstanding specimen of a Pointing Lab. One word describes Goose...DESIRE!!! Yet he's an absolute gentleman and joy to be with. This dog will play the games at any level!!! Complete natural class with a NEVER QUIT ATTITUDE...he's the real deal!!"